This is my first time reviewing the Mazda Miata since 2014 and I can already tell there have a been a lot of changes over the years! 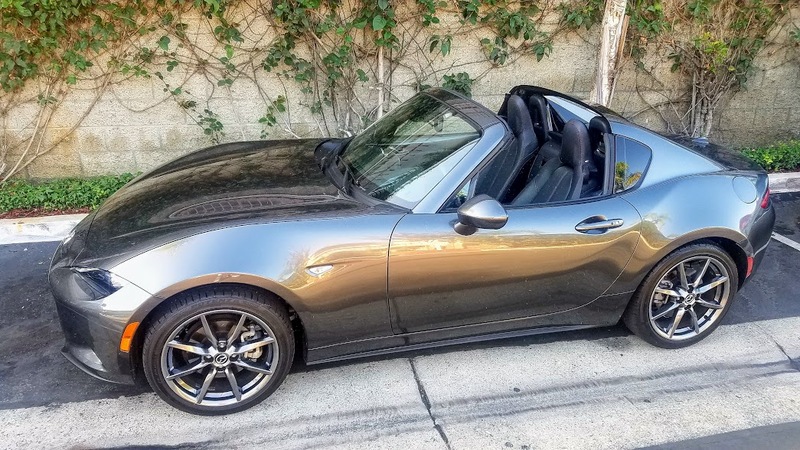 New for 2017 is this Mazda Miata MX-5 Grand Touring RF. The RF is for Retractable Fastback which refers to the power-folding hardtop. But let's get into the review! Thanks to my buddy Mike for the incredible drone photography! The cabin is nicely laid out and there is plenty of legroom for myself and I am 5 foot 6 but taller friends had difficulty getting out of the car. Gauges are bright and controls are all easily within reach. There is automatic climate control, push button ignition and power everything as to be expected with a vehicle of this type! 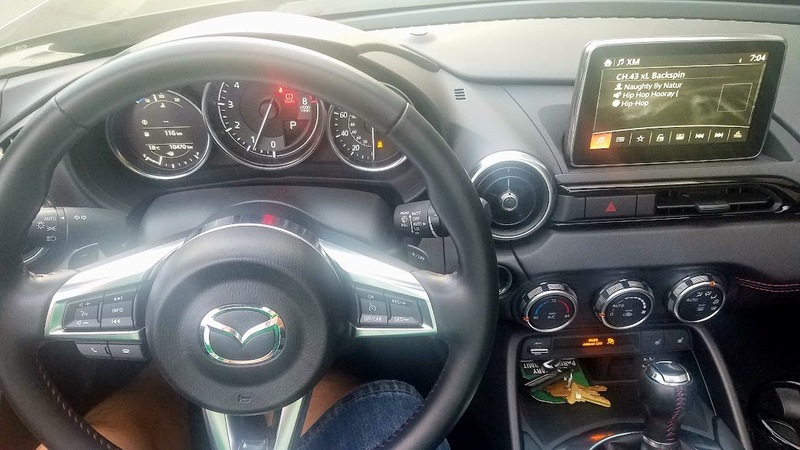 The large 7-inch touchscreen has voice command, HD Radio, Aha, Pandora and Stitcher internet radio integration, SMS text message audio delivery and reply, Mazda Navigation System, SiriusXM, and speed sensing automatic audio controls. The steering wheel has audio, phone and cruise controls. There is a Bose 9-speaker audio system that delivers crystal clear sound with driver and passenger headrest speakers and a subwoofer. There is even a CD player! 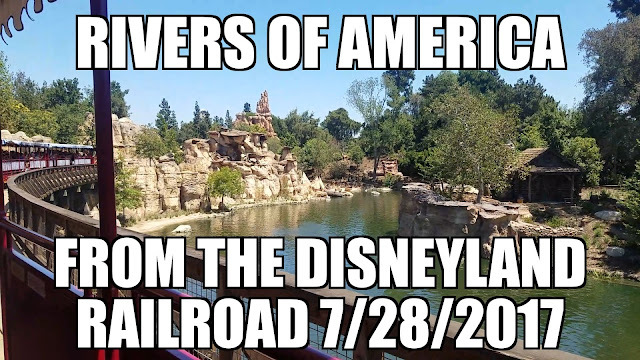 The first place I headed to was of course to Disneyland! My awesome friend Erin and I had tickets to Mickey's Halloween Party, an event that is sold out every single year! 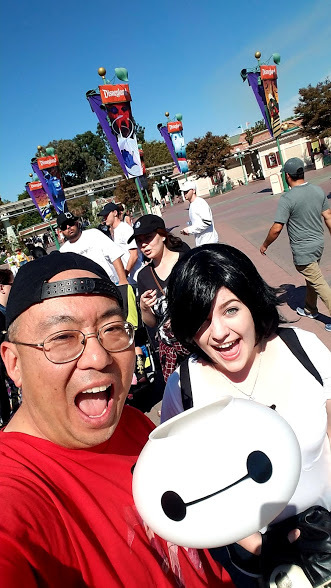 We went as Hiro Hamada and GoGo Tamago from Big Hero 6! And yes, that Baymax is a candy bucket! We ended up with more than enough candy from all the treat stops that we didn't even go to all of them! 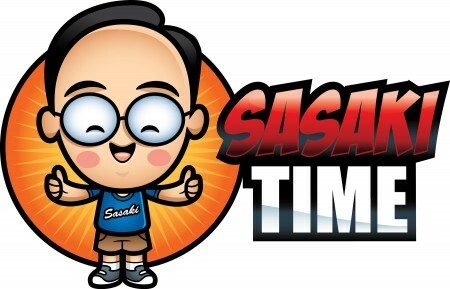 Plus, there are special Halloween fireworks, a Halloween parade and special character meet and greets and other entertainment that make this a good to event every single year! Halloween also brings special food and drink offerings to The Disneyland Resort! 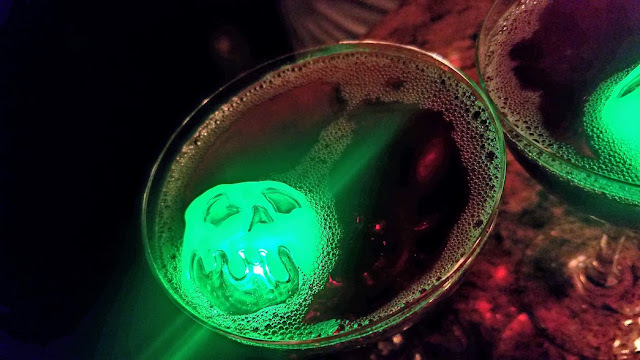 Erin and I both got the poison apple-tini with the exclusive green poison apple glow cube from The Carthay Circle Lounge in Disney California Adventure! 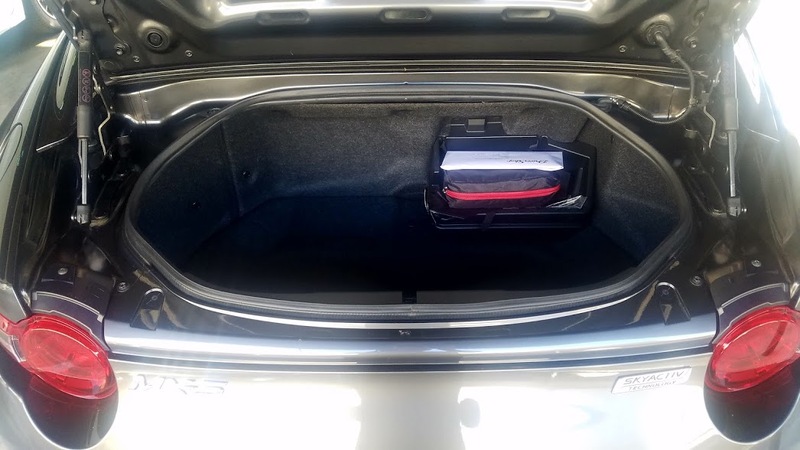 Ample trunk space here with plenty of room for luggage! You get a remote trunk release that comes in handy when your hands are full of souvenirs from Disneyland! The next day was out to find a new coffee place! And a new coffee place I found!! 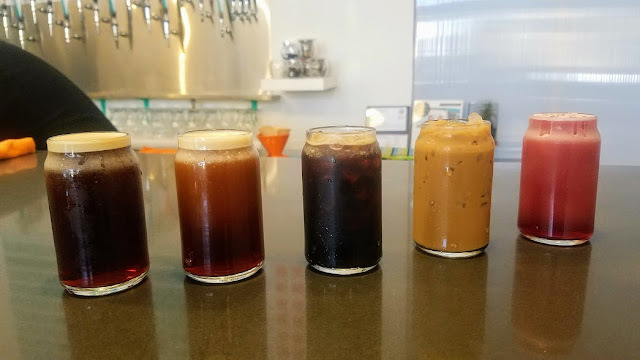 This is Contra Coffee and Tea near the Orange Circle in Orange, CA! They are a craft coffee and tea place that serves up their beverages on tap! They even have their beverages as flights! 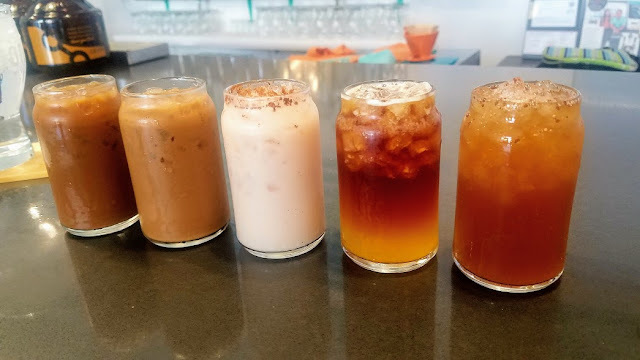 You can mix and match five of their coffee and tea offerings! As you can see I had two flights and 10 drinks! A lot of caffeine for sure but I spent the time talking to two of the owners who are super friendly and we literally talked for a couple of hours. We talked about their business and how they got started, social media and the future of coffee and tea! I highly recommend coming in and pulling up a seat at the bar. 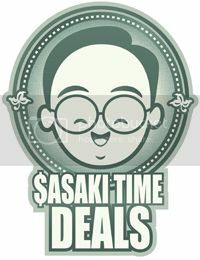 You will become a regular! 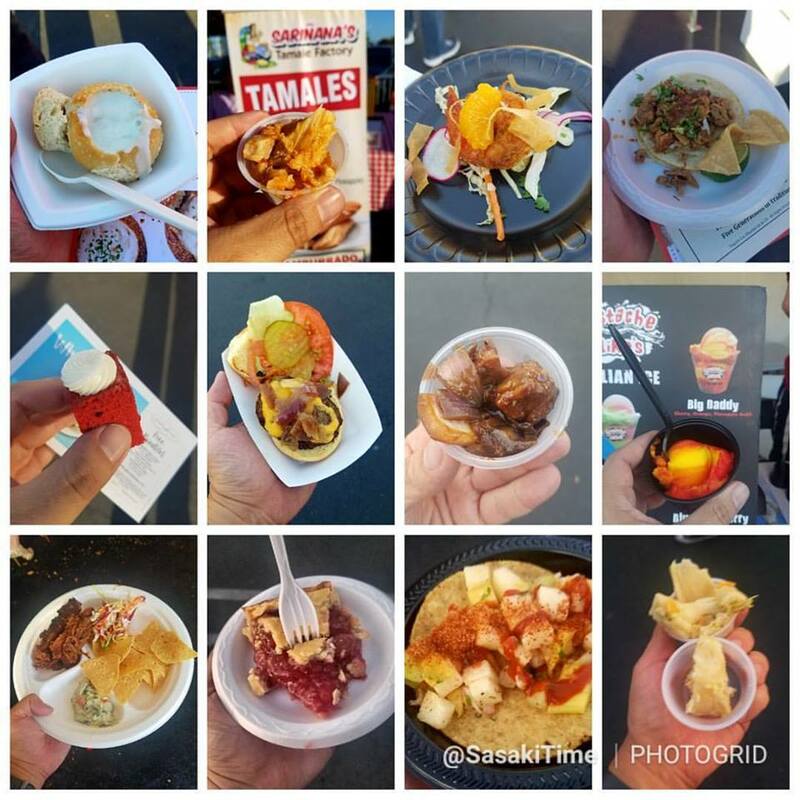 Later that evening it was time to hop into the vehicle again for a media event with food Beast at the Main Place Mall in Santa Ana. 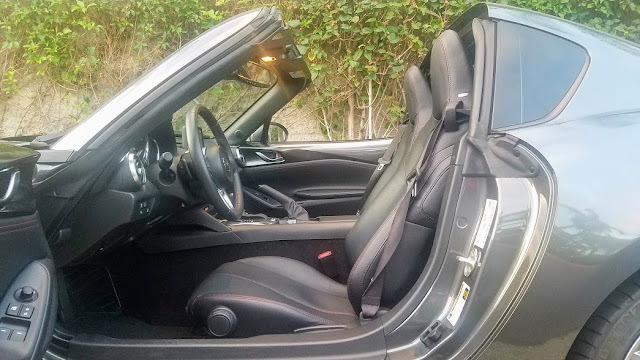 Comfortable power leather seats really hold you in place! Perfect while cruising or driving windy roads! I was even surprised to find two removable cup holders! 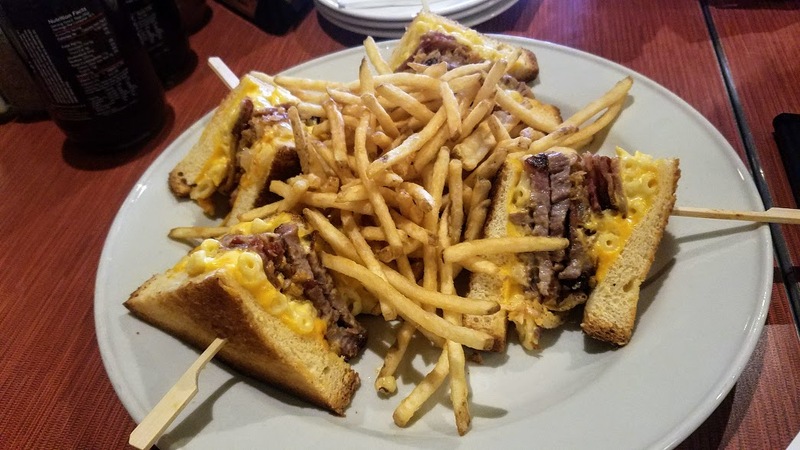 The first stop on the Food Beast was to Lucille's where they have an exclusive BBQ Brisket Mac Melt! You get brisket, mac n cheese, applewood smoked bacon, cheddar cheese and crispy onion straws! I have had it before and it is large, amazing and super filling! We then moved across the way to Wocano for their Monkey Brain! 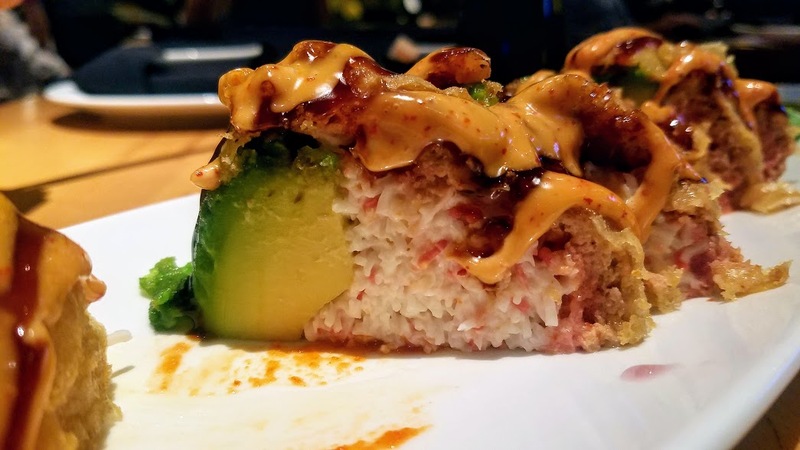 It is a delicious mix of sliced avocado, crab meat, spicy tuna, fried in tempura batter, and topped with spicy eel sauce! You can only find this at this location! 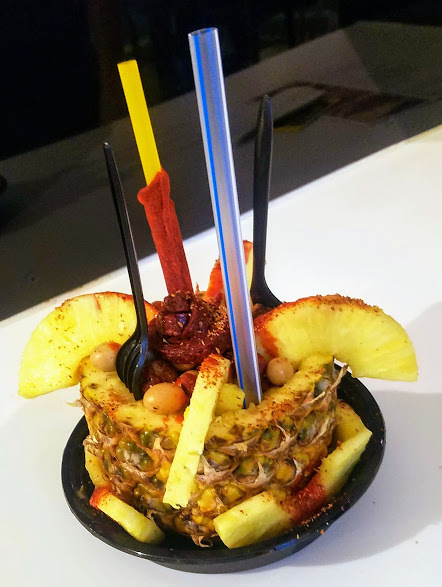 Finally, for dessert we took the mall train to Botana Express for this amazing Pina Loka which contains sliced mangos, pineapple chunks, cucumbers, jicama, peanuts, chamoy, a candy swirl, mango juice and tamarindo sauce all served in a hollowed out pineapple! An amazing combination of flavors and a perfect way to end the evening! Even while parked the Miata looks like it is still moving! Super bright LED headlights make it easy to see the road you are traveling on! One more major food event for the week took my friend Mike and I back to the Main Place Mall for the Taste of Santa Ana! This amazing outdoor event features over 40 local area restaurants, wineries, breweries and spirit companies! 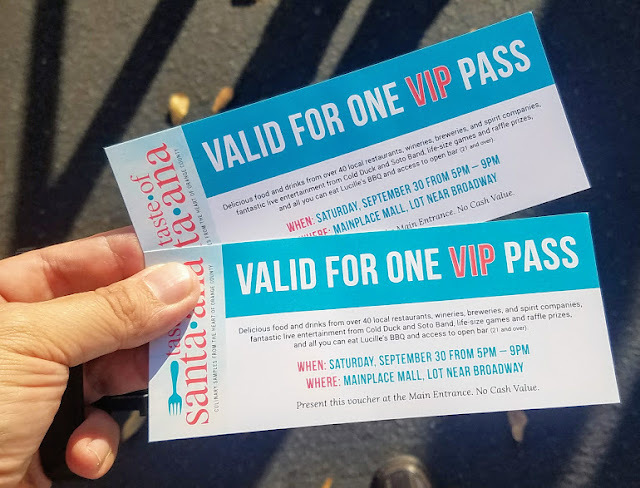 The VIP passes gave us not only access to all the vendors but to a VIP lounge area with open bars and bbq! 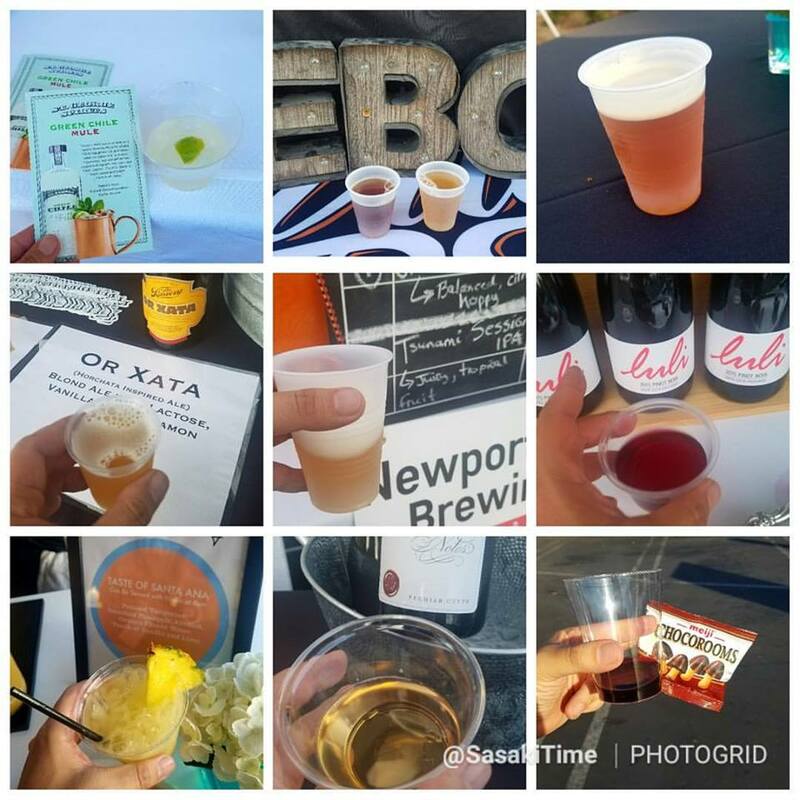 Take a look at some of the breweries, wineries and spirit companies here at the event! A sampling of some of the amazing food we enjoyed! This car demands attention! Once again thanks to my buddy Mike for this great drone photo! 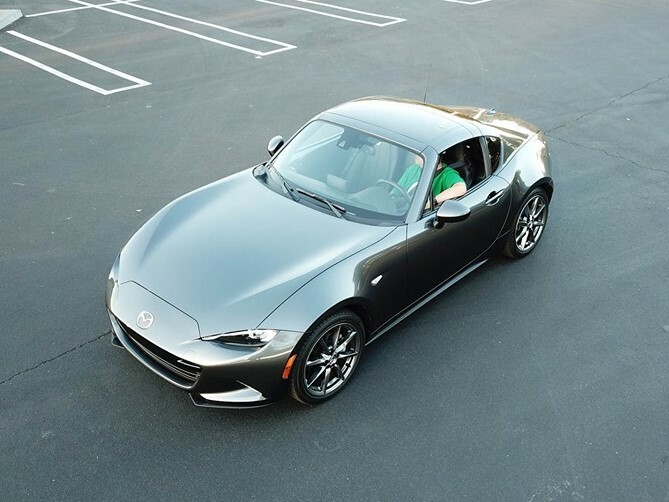 The 2017 Mazda MX-5 Miata Grand Touring RF is sleek and gets stares everywhere you are! The SkyActive-G 2.0L DOHC 16-valve 4 cylinder engine produces 155 HP and gets 26 MPG in the city and 35 MPG on the highway! 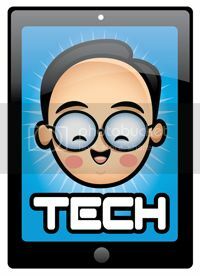 You get dual airbags, side impact airbags, blind spot monitoring, rear cross traffic alert, lane departure warning but it does not have a rear backup camera which would have come in handy. One last food adventure before my review time was done! This time it was to Red Flame in Garden Grove, which is a hot pot restaurant but they have this amazing rib-eye steak dinner cooking on a hot stone for $15! 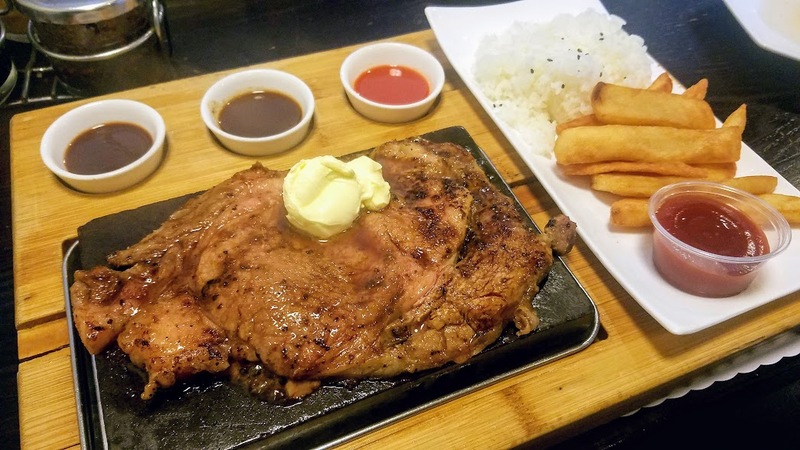 This large steak is served with your choice of sides and a dinner salad! One of my favorite meals! 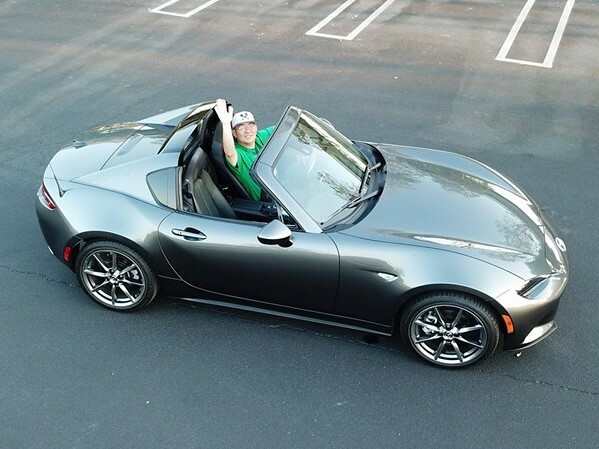 As reviewed, the 2017 Mazda MX-5 Miata Grand Touring RF came in at $34,960. 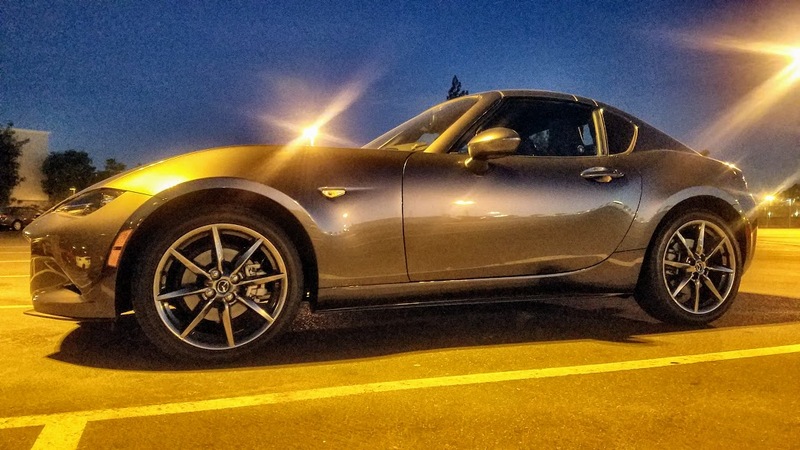 It was sad to see the week come to an end but I loved my time with the 2017 Mazda MX-5 Miata Grand Touring RF! 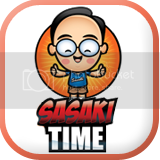 A fun to drive car with great style and features! A car that definitely begs to be taken out on the open road!